New 925 Sterling Silver Hand-Made Genuine Facet Stone Cross. Amethyst is the traditional, ayurvedic, and modern birthstone of February. Amethyst comes from the Greek word amethystos which is translated to mean not drunk which is why this stone is the symbol of sobriety. Garnet is the traditional, modern, and Ayurvedic birthstone of January. Garnet is thought to protect the wearer against depression and also when traveling. 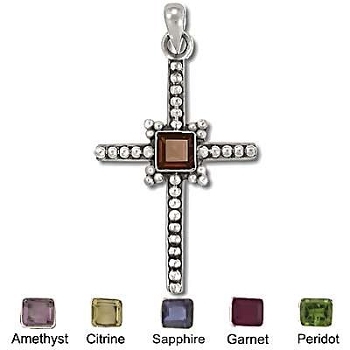 The Garnet has come to symbolize faith, compassion, loyalty, and truth. Peridot is the modern birthstone of August. Peridot is thought to aid in sleep, calm ones nerves, and rid the wearer of negative feelings and emotions.